While it can be easy to spend way too much money during the Christmas season, spending a fortune is not something that you have to do to ensure a great holiday. It is indeed possible to enjoy the holiday season while maintaining your commitment to frugal living. The keys are creative planning and preparation, as well as keeping in mind that the true meaning of the season has nothing to do with excessive spending. Bake cookies or homemade muffins and present them on a pretty plate. Make a music CD of Christmas songs. Frame a collage of treasured family photos. Make a no-sew fleece blanket in printed fabric that reflects the recipient's personal interests. Help shovel your neighbor's sidewalk after a snowstorm. Provide babysitting services for your sister so she can enjoy a date night with her husband. Drive your grandmother to her doctor appointments. Help your mother with her spring cleaning. Provide free tutoring for your nieces and nephews. Look for items at your local dollar store that can be put together to design a thoughtful, yet affordable gift basket. For example, a pretty bowl filled with microwave popcorn, a fuzzy blanket, and a DVD of a favorite movie makes a great gift for almost anyone. Sign up for e-mail newsletters from your favorite stores. Having coupons and sale notices delivered directly to your inbox is a great way to save money on gifts. Make a habit of shopping seasonal sales throughout the year and storing items in a special Christmas gift closet. When school supplies are on sale in August, pick up crayons and other art supplies to use as stocking stuffers for your children. When perfume and scented lotion is on sale for Valentine's Day, pick up a few extra bottles for the women on your holiday shopping list. Have your kids make paper snowflakes for your windows. 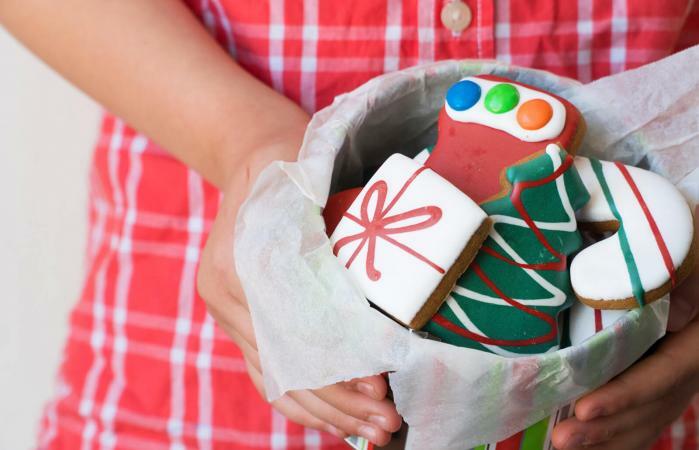 Decorate your tree with popcorn garland, candy canes, and gingerbread cookie ornaments. Use candles to add romance and sophistication to your holiday décor. Place centerpieces on top of small mirrors to make them seem larger. Make ribbon bows to tie on your banisters for an instant dose of holiday cheer. Scatter framed photos from previous holiday celebrations around your home to create a personalized tribute to the spirit of Christmas. Light bulb Santas: Save all of your home's burned out light bulbs for a few months. Turn them so the top of the bulb is on the bottom and cover in paper mache. Round the top a little big and create a small semi-circle where the threads end on the bulb end. Allow to dry. Paint the bottom part of the bulb like a Santa suit, with the top part as a face. Add each guest's name and the year to the front or back of the bulb. Popsicle Stick Ornaments: Glue Popsicle sticks together in the shape of a star and paint with white or yellow paints. Sprinkle glitter on top while the paint is still sticky. Cover with a clear coat of paint and hang with colored ribbon or string. Alternatively, made a sled using Popsicle sticks by arranging five in a V-pattern and then gluing them together. Add runners to the outside edges with sticks glued on sideways. Allow the glue to dry, and then paint them red or green. Personalize with the date of the party or the guest's name. Homemade Snow globes: Make cheap snow globes using canning jars, cheap plastic ornaments/figurines and a little glitter. Glue the small figure to the bottom of the canning jar lid with a waterproof formula. Allow to dry. Next, fill the jar almost all the way up with water. Add some silver, blue, red or green glitter to the water. Put the lid on top of the jar (decoration will be upside down in water) and glue on. Allow to dry. Flip the glob over and add any ribbons or fabric to the bottom of the jar. Shake to make it "snow." While nobody likes to seem like a Grinch during the holidays, you shouldn't be afraid to ask for help if you're hosting Christmas on a tight budget. Suggest "drawing names" for holiday gifts if you have a big family or a large group of friends rather than purchasing gift items for every person. Chances are, the others will love the idea and be grateful that you suggested it. Ask friends and relatives to borrow holiday-theme serving dishes, table linens, and other necessities rather than purchasing items you'll just use a few times each year. Just remember to keep a list of items and their correct owners to make sure everything is returned when the party is finished. Don't hesitate to host a potluck. Tie the occasion to a theme and invite everyone to make a special dish related to that theme, or ask guests to bring their favorite holiday meal. You'll save both time and money in the preparation, and many people will be touched that you asked them for assistance. When shopping for the food required to prepare your Christmas dinner, pick up sale ads from all of the grocery stores in your area. While it can be rather time consuming to do your grocery shopping at several different stores, picking up loss leaders in this manner can save you a bundle when you're preparing a meal for a large crowd. For even more savings when shopping for good deals on party food, turn to websites offering free printable online grocery coupons. You'll enjoy the holiday season much more if you aren't worried about dealing with the effects of over-spending. Be honest with yourself - and your loved ones - about what you can realistically afford to spend during the holiday season and live within your means. Your New Year will be off to a much better start if you aren't dealing with low cash flow as a result of spending too much during the holidays.